The cap badge of the First Surrey Rifles, on the War Memorial at St Giles, Camberwell. William Dent is one of the men named on the Bottesford ‘church list’ of WW1 Servicemen. William Dent was born on the 1st June, 1892, and baptised on the 14th August, the son of Thomas and Susannah Dent. His father was born in 1859 in Bottesford, and his mother in South Muskham, Nottinghamshire, also in 1859. At the date of the 1901 census, the Dent family were living on Grantham Road, Bottesford, in the house immediately next to Daniel Daybell’s farm. William was 8 years old, attending the village school. His father was a railway platelayer, and his oldest sister Sarah was working as a dressmaker. Thomas Dent took an active part in village life. He was Captain of the church bell-ringers, and also a fast bowler in the village cricket team. Ten years later, in 1911, Thomas was still a railway labourer (platelayer) and William’s second oldest sister, Maria, was at home and employed as a dressmaker. William was at this time 18, also at home and at work as a railway clerk. The family lived on what was then known as School Road, now the first part of Grantham Road near the Market Place. Indeed, this may have been the same house they occupied in 1901, next door to Daniel Daybell’s farmhouse. However, this location may be incorrect. An alternative reading of the sequence of houses on School Road in the 1911 census could place the Dent’s home right next to the School itself. It is confusing. The census listed six houses on School Road, which can be equated to the houses seen today between the Old School and Daybell’s Farmhouse. In 1911, the first was occupied by Elizabeth F Daybell, aged 68, a “farmer’s wife”, with her son Herber E Daybell, 34, a “farmer’s son at work on the farm”, and two daughters M.R., aged 31, and Eveline, 24. The second was occupied by the Dents. Then came houses occupied by the families of gardener Robert Cooper, secretary Arthur Lloyd, labourer James Geeson and William Sills, a retired farmer. The problem is that the census does not indicate which direction the sequence runs in, East to West, or West to East. In addition, there is no mention in the Bottesford 1911 census of Daniel Daybell and “Daybell’s Farm” is not explicitly named. But it seems reasonable to propose that Elizabeth Daybell and her family had taken over the farm, in which case the Dents’ house would still have been the next one adjacent to the farm, and the house immediately next to the School would have been that occupied by the Sills family. William Dent’s British Army Pension Records reveal that he served in the London Regiment having attested, aged 23, on the 17th November 1915, giving his residential address at that time as 22 Bath Street, Poplar, Essex. He served as Rifleman 5818, 21st London Regiment. Later, he was re-designated as Rifleman 562655 of the 21st (County of London) Battalion (1st Surrey Rifles), though this was in effect the same battalion as before, as indicated on his Medal Index Card. Following enlistment he was placed in the Army Reserve, then was mobilized on the 18th February, 1916 and posted to France on the 23rd of that month. He was transferred to the 3/21st London Regiment where he was from the 15th June, 1916, to the 17th September, 1916, as part of ‘ExDCY’ Force France (it is not clear what this meant). However, a large part of this time he was back in England being treated for the wound he received on the 16th September, 1916. He was severely injured when he “received” a shell wound to his right arm, buttock and spine on the 16th September, 1916. He was treated in hospital in St Albans, and was described as “going on well”. However, his recovery was not complete, and he was moved to the 21st London Regiment Reserve on the 29th July, 1917, being “permanently excluded from liability to medical re. examination” under the Military Service (Review of Exceptions) Act, 1917. At the date of his discharge, 23rd August, 1917, his address for correspondence was Grantham Road, Bottesford. He was awarded a weekly pension of 22/- and his disability was classed as GEW R thigh (General Entry Wound, Right Thigh). He also received a King’s Certificate and a Silver War Badge number TP/1574. These items seems to have been sent to his father in Bottesford and then forwarded to him on March 31st 1919, when his address was 30 Abbots Road, Poplar, London E14. William was awarded the Victory Medal and the British War Medal. According to the Long Long Trail website, the London Regiment was unusual. 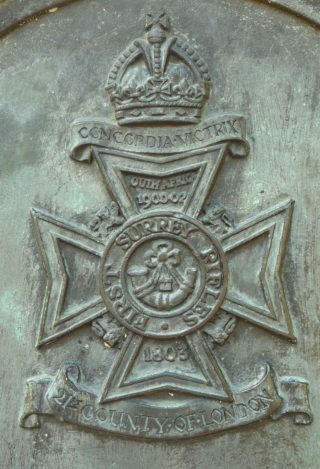 Not only were all of its battalions of the Territorial Force but each battalion was regarded as a corps in its own right. The 1/12th (County of London) Battalion (The Rangers) landed at Le Havre. On the 12th February 1916 it was transferred to 168th Brigade in the 56th (London) Division. This Division took part in the Battle of Flers-Courcelette, one of the actions in the Battle of the Somme. The dates of this action were from the 15th to the 22nd of September, which includes that on which William Dent was wounded. In the 1939 Register is the record of William Dent, born 1st June, 1892, a railway clerk, at 14 Airthrie, Ilford, Essex, with his wife Frances M Dent, born 25th April, 1893. This is probably the William Dent from Bottesford. He died at Ilford, Essex, in 1962, aged 70.